I came across this radio show from the BBC where a group of comedians explore the question of whether the Germans have a sense of humour. A marvellous mix of prejudice, chuckles and new angles on old clichees. Come to weird and wacky Germany! I happened to come across this travel site on one of my recent excursions around the internet. Of all travel writing about Germany, it is the only one I’ve seen that makes Germany sound like a cool and hip place to visit. In fact a positive den of drink, drugs and vice. As for me, I am inspired. I plan to move into a foppish castle at the earliest opportunity. 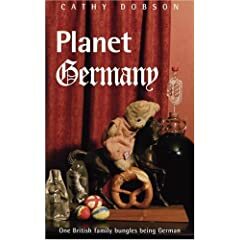 Planet Germany is Comic Read of 2008! I’ve been so distracted by frozen pipes, snow shovelling and trying to keep warm that I hadn’t had time to keep up with Lizzie’s blog. Lizzie’s Literary Life is a fantastic book review blog which never fails to provide great tips on excellent authors, old and new. Anyway… when I logged in today to catch up, I was excited to find Lizzie has published her list of top recommendations from her (very extensive) 2008 reading. And there at the very top of the list is none other than…*drumroll*… my very own Planet Germany – recommended as Comic Read of the Year! Many thanks to Lizzie! And as soon as I’ve finished writing this, I shall be straight off to Amazon to pick up her very top recommendation …. The Chocolate War.